By Grade 7, students realize that humans have many impacts on the environment. In the study of this topic, they will analyse some of these impacts and their consequences, while reflecting upon their personal responsibility to protect the environment. During investigations, the students will observe existing ecosystems and investigate factors that may affect balances within the system. 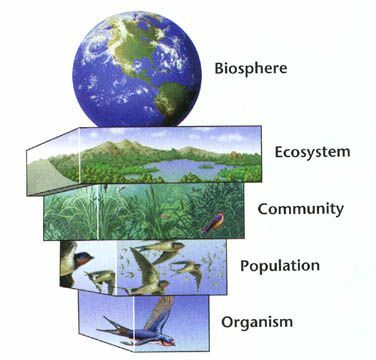 Students will learn that ecosystems consist of communities of plants and animals that are dependent on each other as well as on the nonliving parts of the environment. Ecosystems are made up of biotic (living) and abiotic (non-living) elements, which depend on each other to survive. GOAL #1: I can identify abiotic and biotic factors within an ecosystem and describe interactions between them. GOAL #2: I can explain how things are organized within an ecosystem. GOAL #3: I can list and describe the effect of various abiotic and biotic factors that can limit the growth of a population. GOAL #4: I can describe the roles of organisms within a food web. VIDEO: What is a consumer? GOAL #5: I can describe the transfer of energy in a food chain and explain the effects of the elimination of any part of the chain. GOAL #6: I can explain the difference between primary and secondary succession. GOAL #7: I understand the impact the humans have on ecosystems and ways that we can minimize this impact.